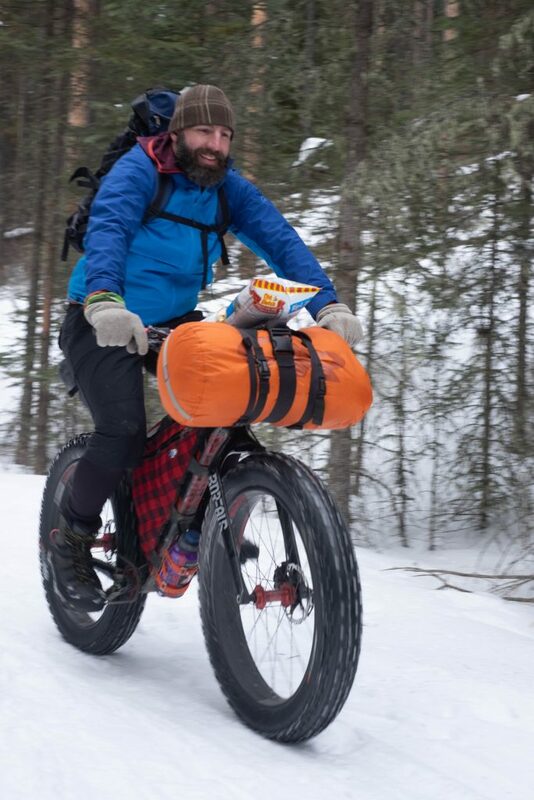 I tried to talk Tadhg into bikepacking the Alberta Rockies 700 but he thought that sounded like a 2 week rather than 2 day ride. So, in the tradition of compromise, I scaled back. I may have to do it solo next year. I did want to do a new and hopefully a bit challenging bikepacking route. After communicating with an Instagram Friend, I was inspired to try a route in the Castle Wilderness area. 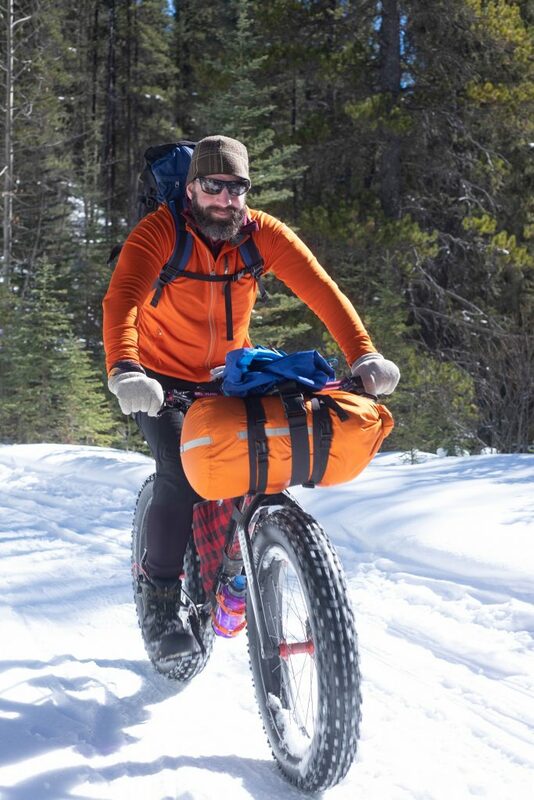 There are several mentioned in Doug Eastcott’s Backcountry Biking in the Canadian Rockies. It is an older book, so some of the routes may have become impassable from floods, avalanches, landslides, and fires. 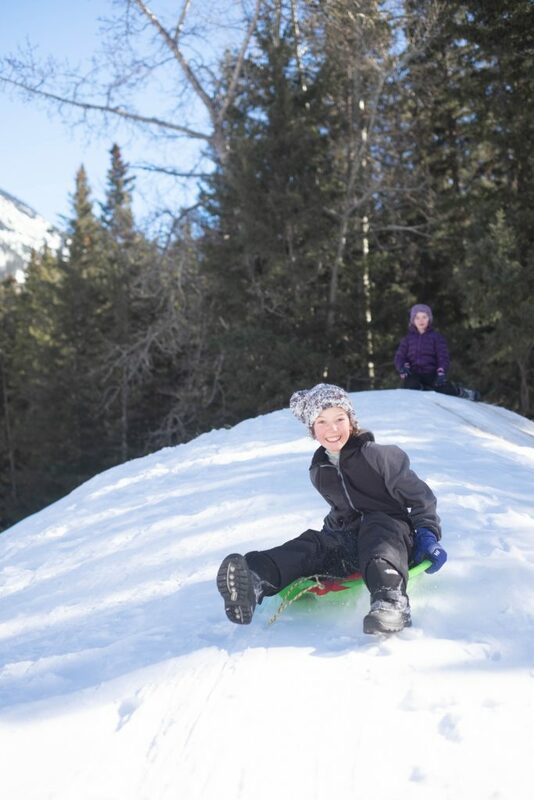 The plan was to take a route from Castle Mountain Resort to Sage Creek recreation area in BC. The first night we’d random camp somewhere on the Alberta side, and the second night at Sage Creek. I plotted out a route on my GPS and we had a plan. We had previous plans to go watch the Stampede Parade. So, we did, as usual bringing our stepladder in the cargo bike so we could avoid the hassle of showing up early to get a good spot. We just saunter up and set up the ladder behind the crowd. We have a great view of the show and we can sleep in as well. After a run to get groceries, we headed off in the van (yes, I did suggest riding there) at around 3:45pm. Since it is over a 3 hour drive to the trailhead, we weren’t riding until 7:30. I started us off on the right foot by misinterpreting the route I had planned and staying on the wrong side of the river. The trail on that side was much more hilly than I expected. Eventually, it ran out entirely in a maze of game trails, forest, and river. I checked the GPS, and when zoomed in, realized we needed to be on the other side of the river. Rather than backtrack, we forded the river, technically, I forded the river, and I carried Tadhg on my back so he could keep his shoes dry (I wore water sandals). After a hundred meters of bushwacking, we came to a quad trail (a handy thing about quads is that they create a lot of braided trails that you can use to get back to the main trail) and we followed the network of progressively larger quad tracks until we got back to the main trail. The real trail was a hard-packed gravel road and we made good progress to the start of the climb. The climb quickly got steeper, but mostly it got more rutted and rocky. My goal was to make it to the gate about 1.5 km from the top of the pass where there was an unserviced camp spot. We made it before dark fell, set up camp and had a great night’s sleep. There were a couple of creek crossings to negotiate while climbing the pass, but since I had anticipated having to ford the Castle River, I wasn’t too put out. Again I ferried Tadhg across on my back since I didn’t want him to have to take off his shoes. The non-water parts of the climb were mostly loose, steep, washed-out, and rocky, so we pushed most of the way. I expected this, since this route had been a road designed for motor vehicles and so it was no surprise to find it was steep and rutted. The view from the top though, was stunning, other than a few unsightly (illegal, rogue) quad trails braiding the pass, the view was quite spectacular. The wind was also quite spectacular. Like many mountain passes, the wind funneled up one side and was ferocious in the pass proper. The frame bag on my bike was catching enough wind to cause the bike to weathervane around the front wheel as I pushed. The descent was, of course more fun. The highlight was a series of pump-track style bumps near the top. I amn’t sure if they were original, or from or to stop vehicles, but they were fun on the bikes (watch out for the fallen trees!). The next section featured dense bushes that were crisscrossing the trail at about face height. We had to go slowly, or risk not seeing obstacles. One tree leaning across the trail snagged my backpack and almost removed me from my bike. The bushy section was occasionally interrupted by sections of avalanche debris. As we got lower down, the debris from the previous years had been cleared, or a path cut around it, so it was easy to negotiate, even if it wasn’t all rideable. Our brakes were given some respite as the valley leveled out somewhat. The riding continues to be fun and occasionally interrupted by more debris. Part of decommissioning a logging road is to remove the drainage pipes and leave the ditch in place as a water bar. These make fun little jumps if you can manage to take them at speed. As we neared the end of the “trail” section toward the logging road we met some folks from BC Fish and Wildlife who were studying wolves in the backcountry. They told me they had seen at least 14 distinct grizzlies on a single wildlife camera. Given the number of berry bushes, I was not surprised, but rather glad that I had arrived out of season for the berries as well as singing heavy metal and punk rock songs on the way down. There were a couple more creek crossings (shallow enough for pickup trucks) and then we had a section of smooth logging road to our goal, Sage Creek Recreation Area. This flat creekside campground was nothing super special, but it did have an outhouse and picnic tables, and it was clean. We met some folks out on a forest road drive in a quad and a jeep, and they offered me beer from their seemingly infinite supply. I was glad for their hospitality, even if they didn’t seem to understand that I really wanted to eat all of the food I had brought so I wouldn’t have to carry it back over the pass. 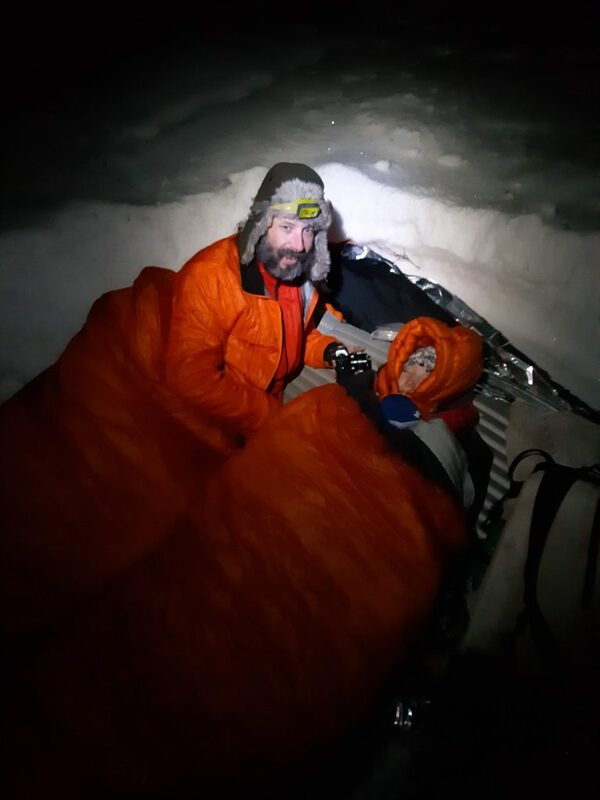 As we were getting to sleep around 10, Tadhg started pestering me about how we would make it back over the pass the following day. I really wasn’t that concerned, and I probably should have spent more time calming him down before going to sleep. 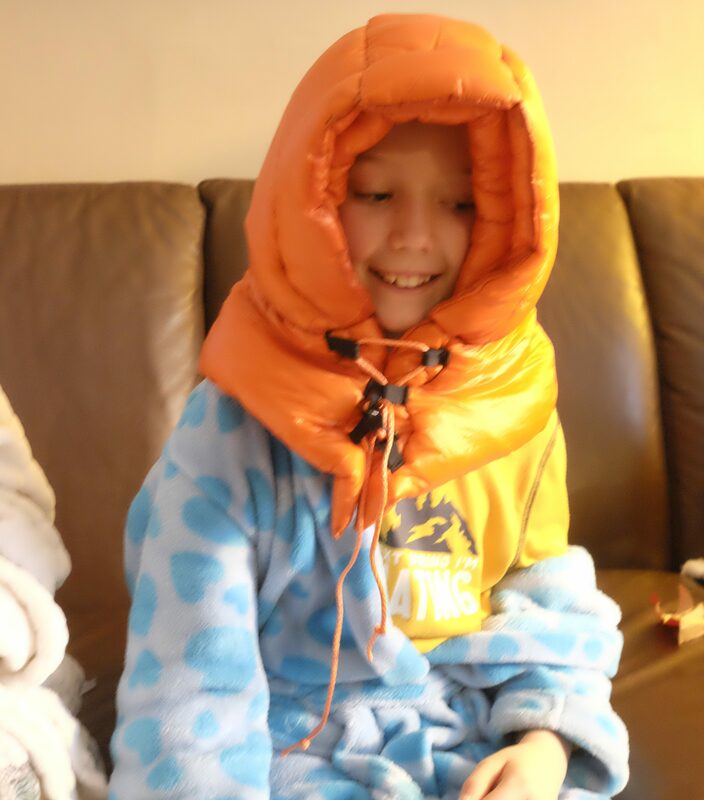 Getting a teenager up at 8:30 AM is not easy, and of course, since this one had been worrying all night about the pass, he didn’t get the great sleep I did, and he felt sick. This translated to possibly the slowest riding I’ve ever witnessed, with me riding ahead at just fast enough to balance my bike, waiting, and him catching up at practically trackstand speed. I soon decided that taking the other, possibly harder, route back would be a mistake. Since we were going so slowly, had the chance to observe more around me, so I took more pictures of roadkill than I usually would. In spite of Tadhg’s lack of energy, we eventually made it back to the top of the pass. Though the downhill on the far side was not always rideable, it was at least downhill. Once we hit the bottom of the hill, Tadhg’s energy returned and he found himself able to keep up with my fastest pedaling. In hindsight, I would probably chose to climb the pass and then proceed to one of the lakes near the top of the pass to camp. Another good possibility would be to attach this to another route such as heading through Cabin Pass and the Wigwam Valley to Fernie. Either way, I’m glad to have seen it and I’ll definitely be back to see more of the Castle area. For those that are into these things, I posted my ride track on Ride With GPS. 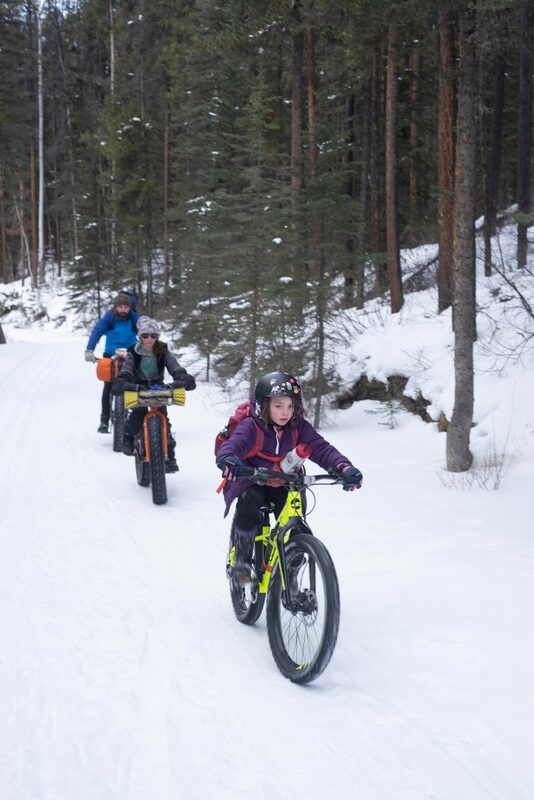 Jeremy loves to take his family on bikepacking weekends. That’s mostly because he loves his family, but also because he loves riding bikes and sleeping outside. He was kind enough to invite me on a weekend ride to celebrate his birthday and to have fun with the kids. 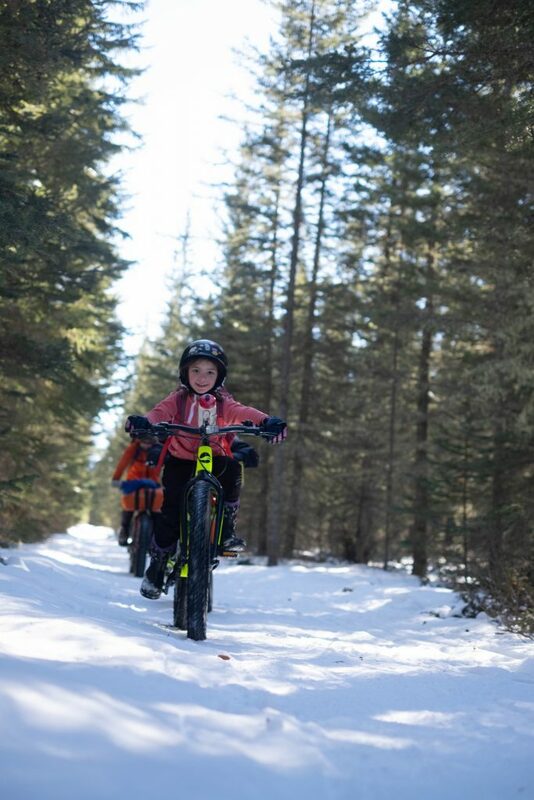 For bikepacking with kids, it is very helpful to have a bunch of trail characteristics. First, things are much easier if there is no motorized traffic on the trails. 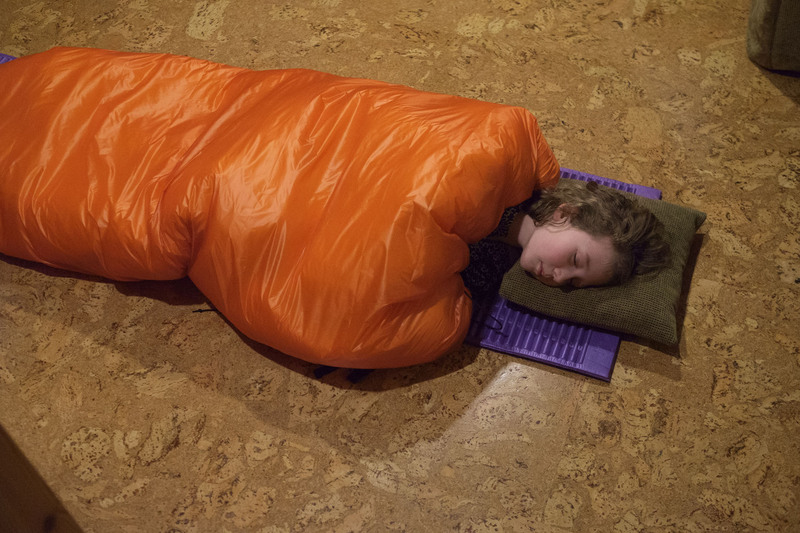 Second, a place to sleep with only a short distance to ride. Third, a fairly short drive to get to the trailhead. For us, that leaves essentially 4 trails available for weekend riding. Since 2 of them were closed and the third was booked up, our choice was made for us. Cascade Fire Road is an old fire road, now a trail. Of our options, it is the least technical, and sees the most equestrian use. It has 2 campgrounds that can be reached by bike. We booked our sites, and watched the weather forecast go from cloudy to showers to rain. As the forecast grew worse, the number of people coming with us dwindled. By Friday, it was Fiona, our friend Carla, and me for Friday night, with Jeremy and Cadence joining us for the Saturday night. The car ride out to Banff park was fairly constant rain, but by the time we pulled into the parking lot, the rain had let up a little, and as we started riding, it stopped raining entirely. About 3 minutes after we had set up our tarp. Conveniently, someone had stacked some firewood at the eating area, and though it was raining fairly steadily, we managed to get a fire going to roast our Burritos (well, alternately roast 1 side while the other got soggy). We didn’t hang out long after dinner, it was late and raining, and we were ready for bed. Since Carla hadn’t been bikepacking before, I lent her some stuff, including a hammock, bags for the bike, and a bike. 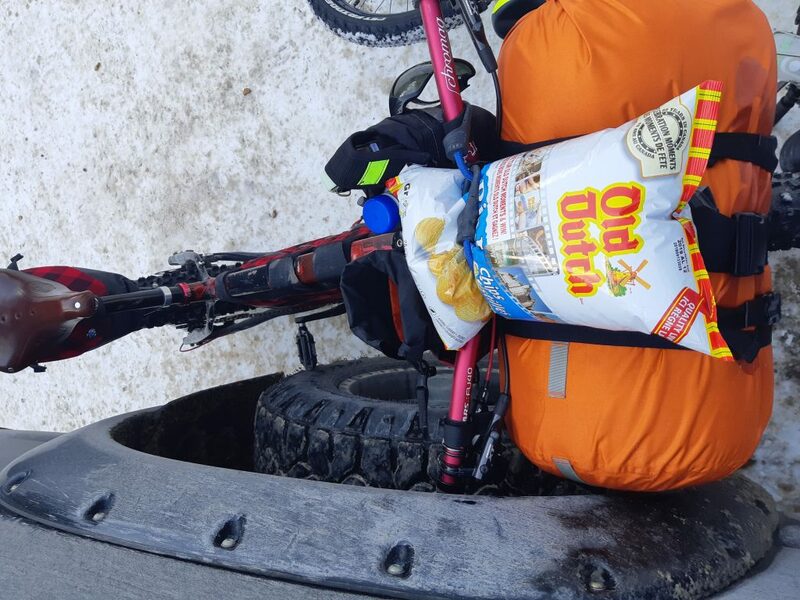 While the hammock wasn’t ideal for her, lending her Tadhg’s fatbike was a great idea since the trail was ridiculously muddy. 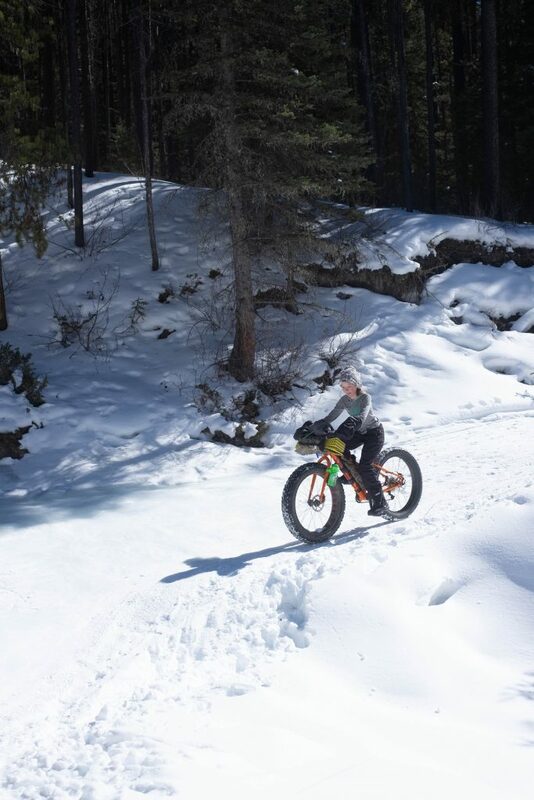 It didn’t take much pushing downhill for Fiona to wish that she had brought her own fatbike. Carla was also glad that she spent the last few winters riding bikes so she was a bit more familiar than most with slippery surfaces. 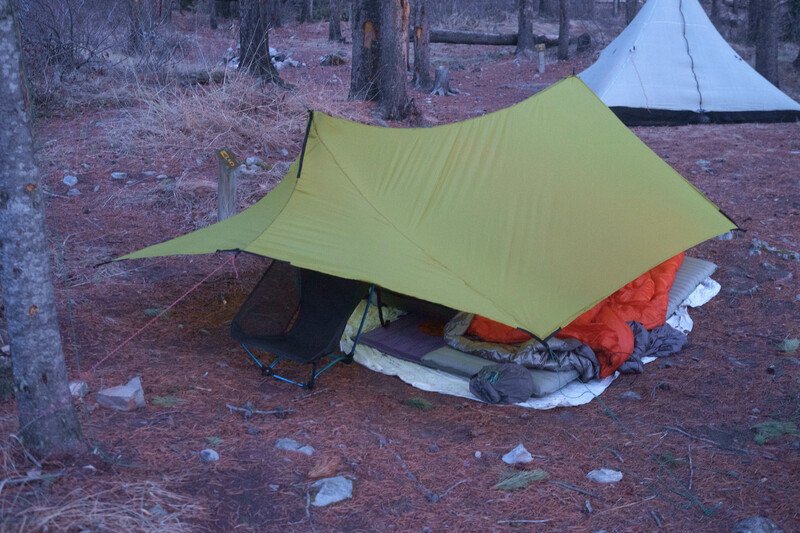 Last fall, I started using a new tarp that I sewed up myself. I used a caternary cut to try to have a shape that would hold up better in wind as well as shed rain with less pooling. I used Silpoly instead of Silnylon to avoid having to re-tension the lines in rain. This was its first major rain test, and it rained steadily and sometimes heavily nearly all night. I am happy to say that we were dry in the morning, though the rain was not as wind-driven as it sometimes is. The second night I pitched the tarp lower to shelter us more from the wind. Although it worked very well at wind blocking, we did get a little more condensation, which is typical in any shelter with minimal airflow. Fiona had some minor clothing issues, her “magic” raincoat, that we had purchased a couple of years ago for a trip that seemed likely to be ridiculously rainy, had lost its magic, and its waterproof quality so that her down puffy jacket underneath got quite damp. The following day she used her SOL Emergency Poncho as her rain layer. The poncho provided excellent protection, especially since the adult size reached nearly to her ankles. I had my MEC cycling rain cape. The MEC cape was a nearly perfect cycling rain garment and surprisingly affordable, so of course it was discontinued a year after its release – I will miss it terribly when mine finally wears out. As my warm layer, I had my new favourite jacket, the Men’s Essential Jacket from Spirit West. I cannot say enough good things about this jacket, it is warm, still warm in the wet, and is 260g of ridiculously light. I can’t imagine that it will be very abrasion resistant, so I have no plans to wear it when trees are whipping at my arms. Disclaimer: I paid full price, I am not affiliated with them, though I won’t turn down a discount on the rest of the family’s jackets, there are no arrangements or expectations of such, I just love the jacket. Jeremy did arrive with his daughter Cadence on Saturday afternoon. I had no concern that he would arrive since he is so consistent with his lack of concern about rain. 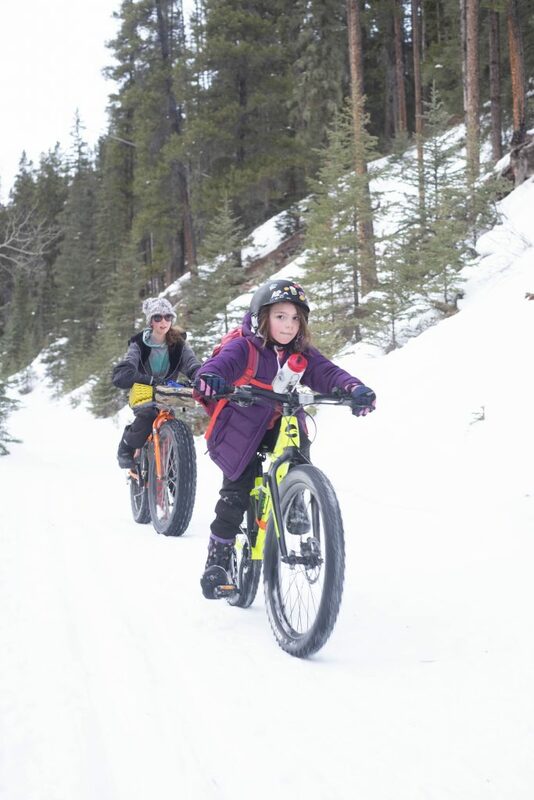 Cadence had been a real trooper and had ridden most of the way in spite of her skinny 20″ tires and the slippery mud. 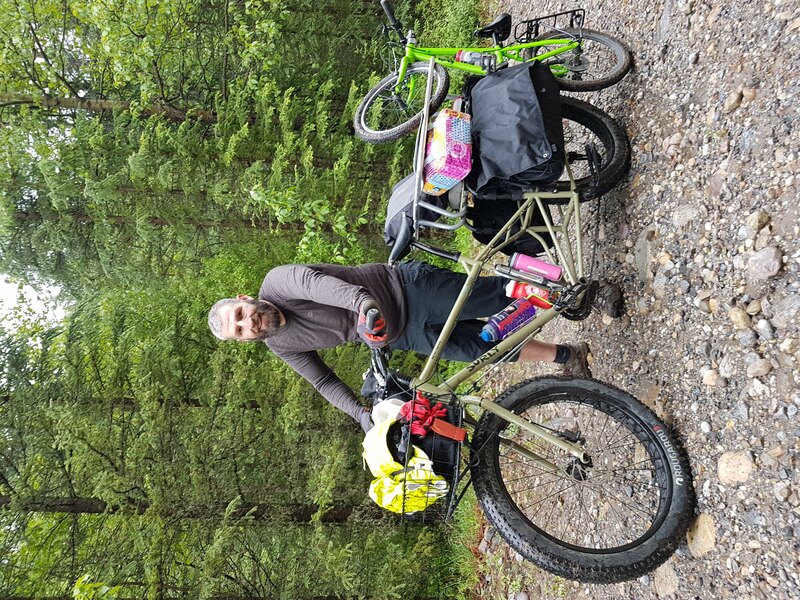 The whole time he was riding in, he was thinking of how glad his wife was that she had stayed home, not because of the rain, but because of the deep mud that would probably have prevented her from getting her cargo bike and 2-year-old in to the campsite. The rain had mostly cleared by the time Jeremy arrived, but made further appearances during the evening to prevent our drying of clothes. It wasn’t a big problem, it simply forced us to put our rain gear on. As we sat around for the evening and Fiona and Cadence played, several Elk walked by just the other side of the river and then forded the river just upstream from us. Morning dawned sunny. Though I woke up early, I managed to get myself back to sleep to let the grass and shrubs dry out a bit before getting up. By the time Fiona and I got up, Jeremy had eaten breakfast already. Friends don’t let friends drink bad coffee, so I had promised Carla some Aeropress as an alternative to her having to choke down the foul-tasting liquid known as instant coffee. Jeremy takes care of his own coffee needs with a pour-over filter and premium coffee – he is one of the few friends of mine who have more sophisticated home coffee setups than me. While packing up camp, we were treated to a bear walking by. It was the best kind of bear encounter, with the bear completely unconcerned with us. It’s always encouraging to see wild animals that don’t think people are a source of food. Of course I had my bear spray in hand with the safety off, but my camera was already on my bike. Jeremy was more prepared. In spite of the dry morning, the trail remained quite muddy. There was a great deal of pushing bikes through mud on our way out, but there was more downhill than up, so progress was made. The last 4km are an enjoyable smooth downhill. We had to encourage the kids to keep in control, especially Cadence with her small wheels that are much easier to knock off track than the adults’ big wheels. In spite of Jeremy’s encouragement to use lots of brakes, Cadence did catch the edge of a rut and went down hard. She didn’t cry for long, and she got herself back up, so I thought she was just bruised. Jeremy carried her and her bike in his cargo bike the remaining 100m of trail and bit of road. She did complain about her arm being very sore, and Jeremy was thinking there could be a fracture. In fact, when they got home, they made a trip to the hospital and she had in fact fractured both bones and is now wearing a cast. She is definitely a tough girl! 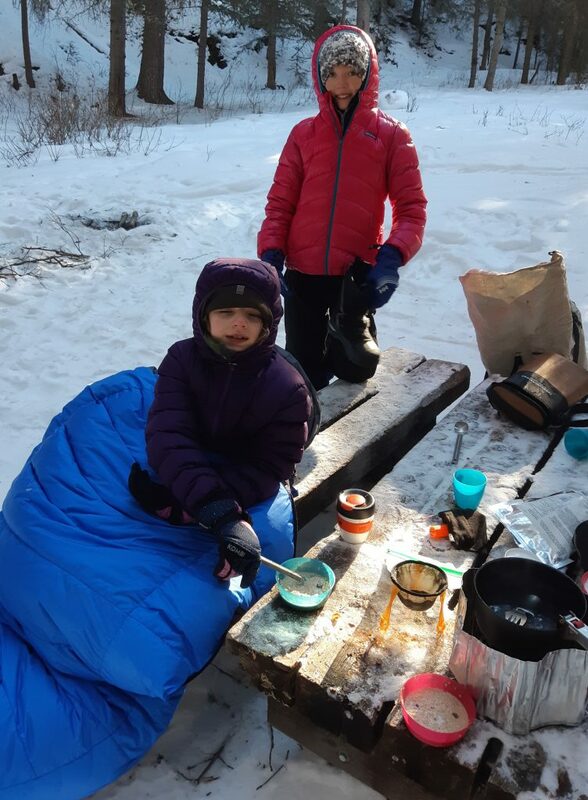 Spring Family Bikepacking Indoctrination Weekend. When you get outside with your family as much as I do, you start to want to get other families hooked (or maybe that’s just me). 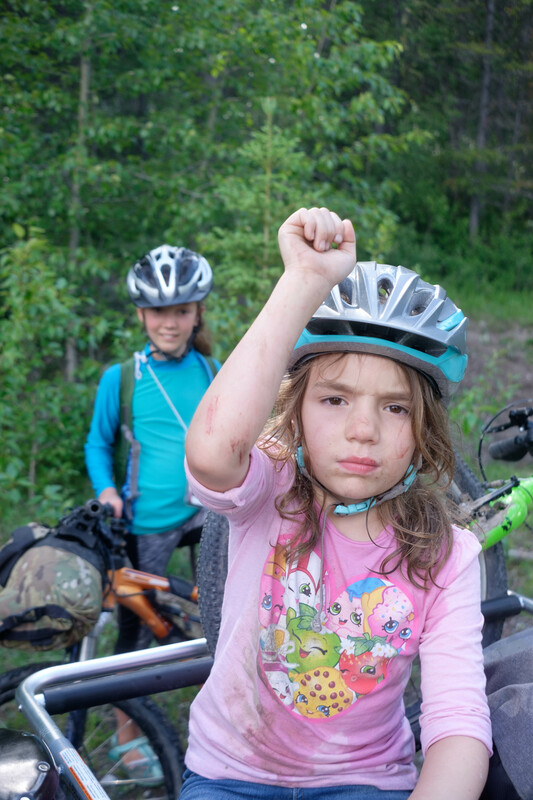 With that in mind, I convinced This Mom Bikes that we should do another family bikepacking weekend on the Elbow Loop, this time as a two night trip. We invited a few friends, and booked some campsites. With a couple of weeks to go, it looked like there might not be enough sites for the number of people coming. Sadly, many of the people we were hoping could come had other commitments or had to alter their plans. There must have been a cool dad’s conference that I didn’t know about because several were away for business that weekend. By the time we hit the trail, we were down to just half of my family, Lindsay’s family for just the first night, and another couple with their wonderful daughter. Definitely not the major event I had braced for, but probably a better size group for me and my introverted ways. Lindsay got to take her new Surly Troll on its first bikepack adventure. She built it up herself based on a frame and fork with Rohloff/Generator Hub wheels that she built herself. It is one of the most well-rounded bikes I’ve seen, good for everything from paved road to rocky singletrack either loaded or unloaded. It was probably the most suitable bike in our crew for the trail we were on. Tadhg and I had met Becky and David, and their daughter on a trip on the long weekend. 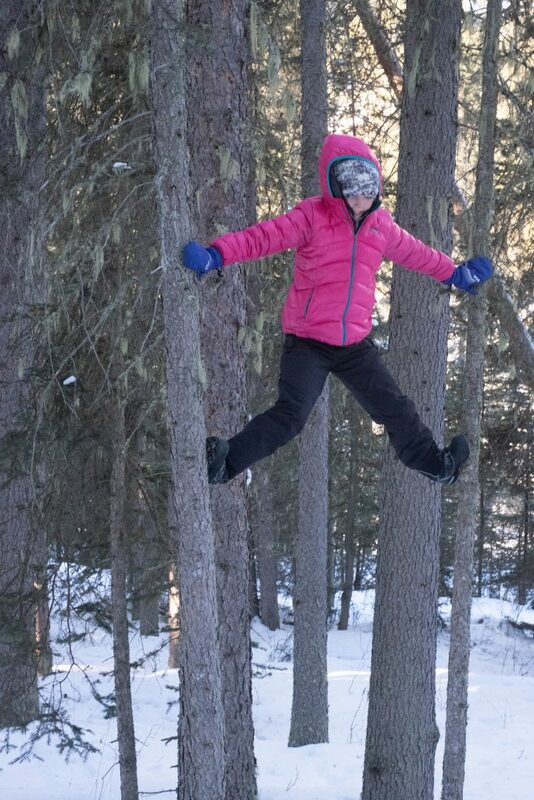 It seems like the backcountry is where the most awesome parents go. It wasn’t more than a few minutes before I realized how much I’d like to have them come on the family bikepacking trip. I am very grateful that they came. Not only were they fun to hang out with, but their daughter blended in seamlessly with the rest of the kids’ gang. It was great to see them “spying” on the adults, building, hiding, and chasing in the forest. Since it was their first family bikepacking trip, Becky and David didn’t have as finely tuned setups as I do, but with a quick rack purchase, some borrowed bags from me, and some ingenuity, they were ready to ride in no time. 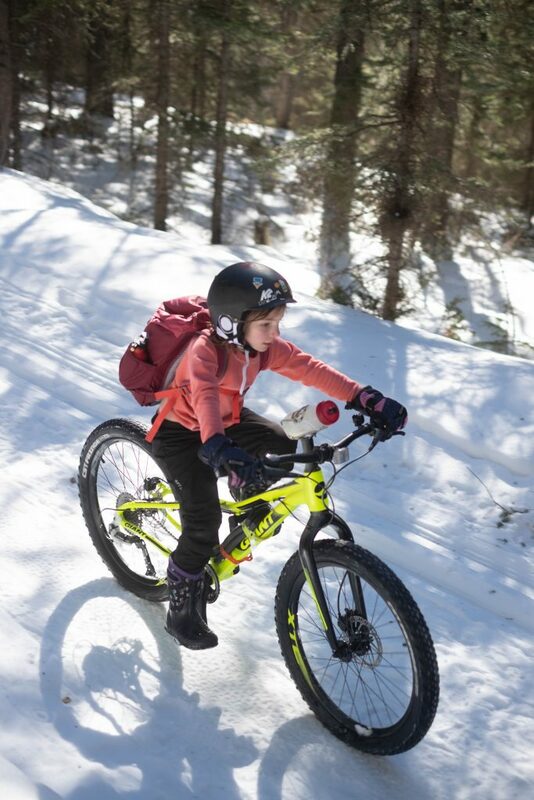 Their daughter felt left out with her packpack not matching the official “bikepacking” gear, so I strapped it to her handlbars with spacers that Tadhg built, and the red strap that I built to hold my sleeping roll when I started winter bikepacking. This made a young girl very happy, since she now felt included – even though there was nothing wrong with the backpack. My instagram friend Lori came for the second night of our ride. It was great to meet her in real life. 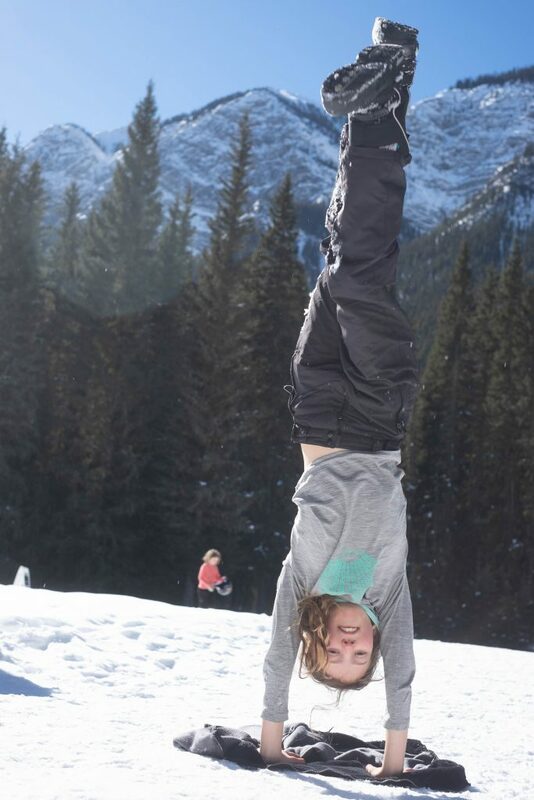 She has a great love of being active in the mountains and she got along well with all of us. Her friend Philesta completed our group. Though Philesta did not bring her bike this time around, she hiked/ran with a packpack at a similar speed to the families biking. Her children are older than mine, so it was great to get some tips on living with older teenagers and beyond. I’ve been getting a lot of credit for organizing these multi-family weekends, and I am flattered. I think a lot of families want to get out and be active, and if I can help, I am totally willing to share. Especially since I don’t really have to put myself out to plan these things. 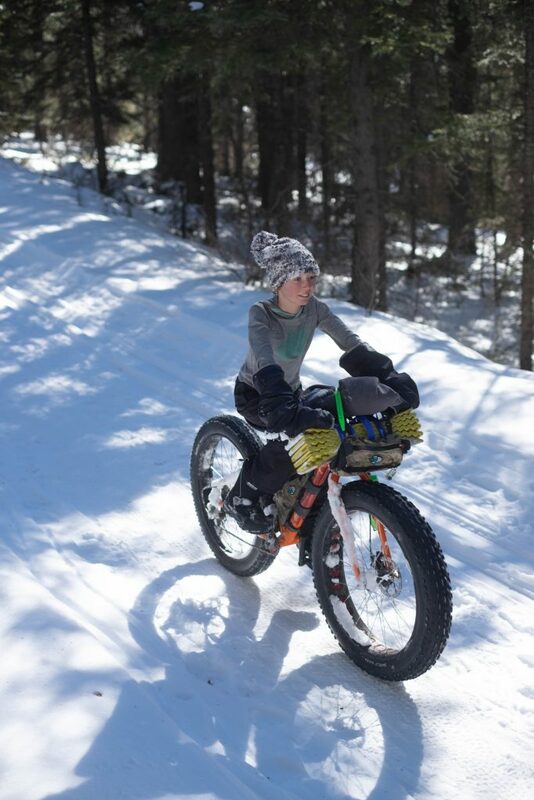 All I really do is plan a weekend when I’d go bikepacking with my kids. Then I invite a dozen or so others, and it becomes a group. There isn’t really much actual organizing. I am there, of course, and I am willing to answer questions both before and during the trip. Usually, at least one person asks me for a gear list. Sometimes people ask if their gear is good enough (usually this gets a yes). I try to leave lots of room to do things differently since there are different priorities for each family. I generally bring enough coffee to share. I have a no douchebags rule that I adopted from my friend Mel, but I’d probably be lenient with even that rule if you had to bring your brother-in-law along to keep your spouse happy. 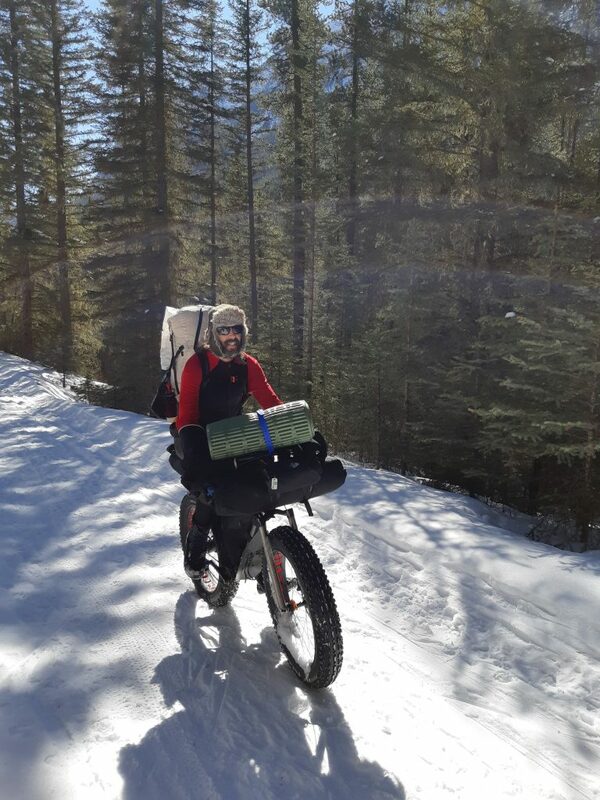 I have high hopes to get more of my friends out winter bikepacking with us this year. When my kids were young, they took naps. Tadhg stopped around 10 months. Fiona would still occasionally nap until she was 5. Now this is purely anecdotal, but Tadhg mostly napped in a crib at home, while Fiona took part in what has been a tradition in Scandinavian countries for generations: the outdoor nap. For safety reasons, dried mango was removed after the picture. No matter what the temperature, I would take her outside to sleep after lunch. Usually, she would be in the bike or a stroller, but sometimes she would just lie down on the deck, or in a sled. Now I have a lot of experience with being outside, so I know how to dress a baby to be comfortable in -30ºC, professional driver, closed course, don’t try this at home, other fine print. There is a belief that sleeping outside may help children resist viruses, or improve their health, or just improve their sleep in general. I’m comfortable that at worst it does no harm. What I am certain of is that it can free a parent to get things done that otherwise might not happen during a nap. I often made trips to get groceries, to visit friends and relatives, and any other errands I wanted to do. I was never a servant to the nap.